Individual team members also placed highly, including sophomore Brandon Almeida of Hilmar, California, who received the High Individual Overall. Almeida placed first in Jerseys and was fifth in oral reasons. Senior Caitlin Lopes of Los Banos, California, placed third in oral reasons, and teammate Hannah Neer of San Luis Obispo, California, placed fourth. The top three overall winning teams were Cal Poly, Iowa State and Ohio State. Working on four-person teams, the students judged 10 classes of dairy cattle. Each contestant then gave an oral presentation (called reasons) defending their placings for four of those classes. Cal Poly’s dairy cattle judging teams are coached by dairy science Lecturer Rich Silacci and assisted by Professor Stan Henderson. 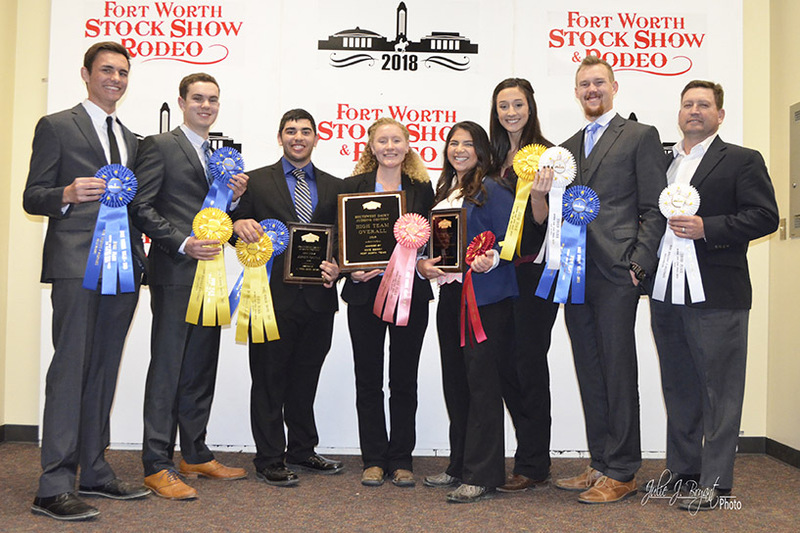 Pictured from left to right are students Hank DeVries, Nicolas Marsigli, Brandon Almeida, Hannah Neer, Caitlin Lopes, Alexandria Lopes and Jack Vander Dussen, and coach Rich Silacci.